Ever since we were introduced to the Paleo diet concept, we’ve been interested in how food affects human physiology. One of the main factors in today’s SAD (Standard American Diet) being really not optimal for humans is the gluten in the immensely overwhelming diet of starch that typical Americans eat. While we try to stay away from starches in the form of grains or sugars, we do want to indulge in our occasional treats. 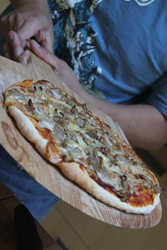 Last year, Nick made a “Paleo-friendly” pizza dough with coconut and almond flours, and this year I’ve made several Paleo (or pretty Paleo-Friendly) dishes. While “gluten-free flour” is really NOT Paleo (the main pillars of the Paleo diet are to eat real foods – plants and animals – and to stay away from most processed foods and foods that are agriculturally based; that is, not commonly occurring before the dawn of agriculture), it is gluten free, and we’ve been especially interested in finding out how gluten affects our bodies. Some people say they have no problem with it, others report that after going Paleo they realize just how much gluten was affecting them. 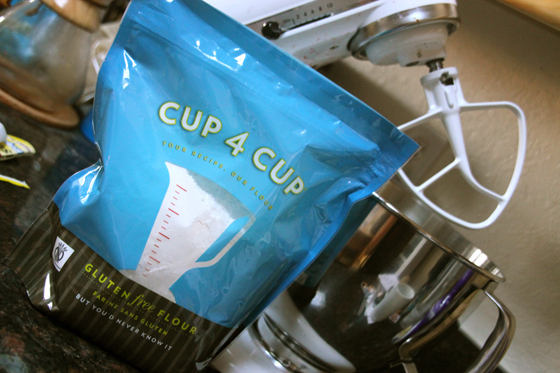 Anyway, of course one of our favorite chefs is Thomas Keller, and he has developed a “Cup for Cup” gluten free flour that can be used just like all-purpose flour. This is a very interesting development in the world of gluten-free foods. Before, most “gluten-free flours” were not like all-purpose flour at all, and did not yield the same results as “regular” flour. Bob’s Red Mill actually does make a gluten-free flour that is supposed to be like all-purpose flour, but you have to add varying amounts of Xanthan gum when using the flour in different applications; in doing research for this post I’ve seen a few interesting products from other brands (listed below), with varying instructions for different uses, but I haven’t tried them yet. Chef Keller’s C4C has Xanthan gum incorporated into it already and supposedly no additional amounts are needed, even in different uses. Tonight we decided to make pizza dough. While we’ve been able to pretty much cut out bread from our diet, we just love pizza and its crust. 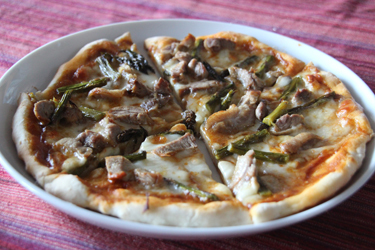 I looked up a recipe for a quick pizza dough and found one at allrecipes.com (I love that site). 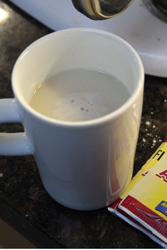 I mixed the sugar with the water and added the yeast (be sure not to kill your yeast – I nuked a cup of water for 20 seconds in the microwave to get the optimal temperature – if it feels hot to you, it’s definitely too hot for the yeast), then I let the mixture sit for 10 minutes, so the yeast could eat up the sugar and create lots of lovely gaseous bubbles (this is what makes the dough rise). 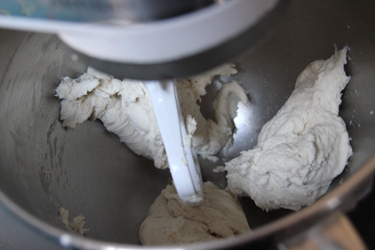 After that, I added the rest of the ingredients and gave it a spin in the mixer, at first at a slow speed just to incorporate everything, and then a bit faster, and just until everything was combined nicely and the dough was formed. It pulled the excess dough from the sides of the bowl and made a pretty good dough ball, so that was nice and neat. After that, I let the dough rest for 5 minutes. 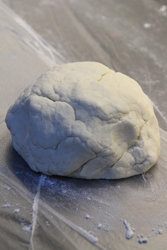 Then I turned the dough out onto my covered and floured countertop and gathered it into a ball. I tried to not knead it too much – I didn’t want it to become tough – the recipe makes enough dough for two pizzas if you’re doing a nice, thin crust (we made two from this amount). 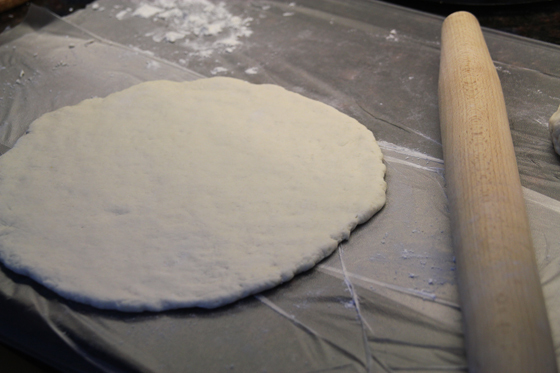 I started rolling out some dough. I noticed it wasn’t as “stretchy” as normal dough is made with AP flour, but it seemed just a bit drier on the edges. I just made sure to pay a little more attention to the edges as I was forming the pizza with my hands, and it came together perfectly. We topped it, and popped it in the oven. As it baked, it rose a bit which was great (pizza crust made with almond and coconut flour is a completely different thing from this), and it browned nicely. The pizzas came out beautifully! 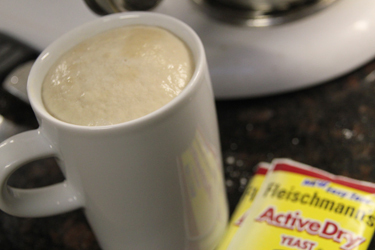 I was curious as to how this flour would behave vs. regular flour – I actually really liked working with it. It seems to not be as sticky as AP flour in this application (I made a batch of dough with AP flour after to compare), which is cool because working with sticky dough is kind of a pain. While this will still be a treat we don’t indulge in much, it’s nice to know we can easily whip up a pizza crust that is gluten-free ourselves. What’s the general opinion about using teff for baking since it has no gluten?